Status: Contest finished on 28-02-2010. Nonstop2k is an emerging producer community that is running a new remix contest. You have three different genres to choose from: Trance (Rank 1 — L.E.D. There Be Light), House (Leventina — Night Shift) and Progressive House (The R3bels — Lifestyle). Good luck! 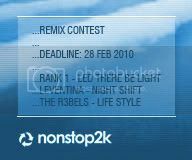 Hereby we present the very first remix contest of 2010! Just like last competition we have a blend of different genres to choose from. Since you guys suggested mostly trance tracks I have chosen the one that was requested to be remix most, Rank 1. In the hardstyle and house genres there were not so many suggestions, so I picked one of the 3 hardstyle tracks suggested, Lifestyle by The R3bels, and I picked the house track myself. The chosen house track is Leventina — Night Shift. This progressive house track has a nice trance-like melody and a steady progressive beat, which I think could be taken into many other directions. I’m eager to hear what you guys (and girls) can do with each of these tracks. Happy remixing and that this year me be a productive year to all of us.